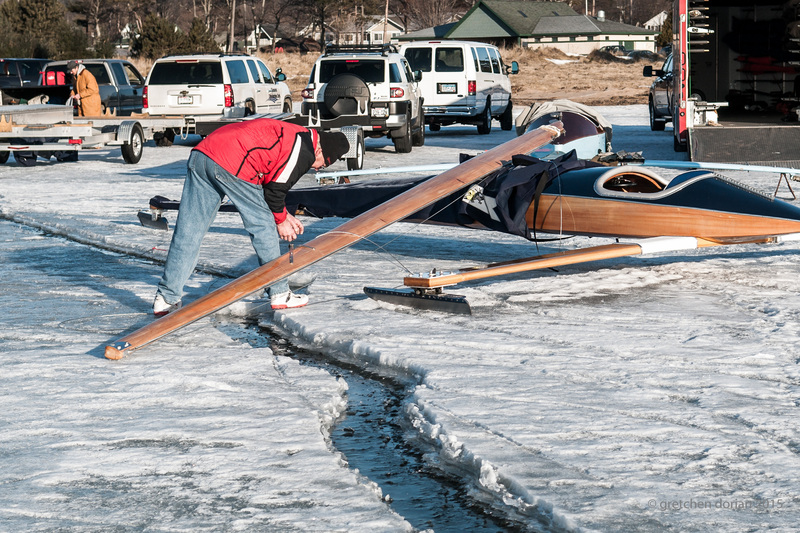 It was truly a late call to have a regatta!..Ice conditions due to high temps and snow, led to the Annual NWA Regatta (Stern Steerers, etc) to already being canceled. Scouting by Mike Derusha, of Menominee, MI, directed by friends in Gladstone, found sailable ice and a big enough plate south of Gladstone and North of Escanaba. As of March 15th, all ice shanties had to be removed from ice. (Gladstone had over 1,000 shanties – as it is the “ice-fishing” capital of the Midwest!) and was much easier to sail and scout. I heard that the “races were on” on Wednesday, March 18th, to start on Friday, March 20. I started to “unpack” and reassemble my winter photography gear, in anticipation of the following weekend. Responsibilities and a broken-down 4×4, had me scrambling for wheels (I rented a car) and was able to leave Northern Lower Michigan, and cross the Mackinac Bridge and hit US-2 West by 11:00 am on Friday. I arrived in Gladstone in the late afternoon. Texting Official Scorer, Deb Whitehorse, who was offficiating races in progress, she was able to give me directions on where to park. I parked, loaded my gear into my sled and started the mile long hike out and over to the starting line. As I was kinda on the port tack line….coming off from the starting line….a few “A” Skeeters, skirted me, thinking I was an ice fisherman. Following their race…they (Deb & Ken Kreiger) drove out in truck, picked me up, and then drove as fast as we could back, as they had to start the very next race immediately! Shooting on Saturday, in varying displays of light, was not making me happy. The light was very flat and only once in while would the sun burst out for just minutes at a time…truly work to get decent shots this day. Sunday…found the ice was starting to break away from the shore. 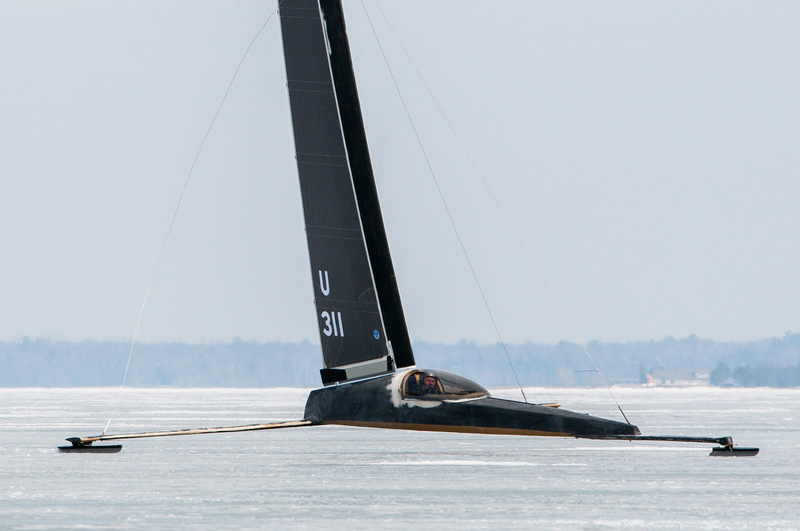 The possibilities of not being able to get cars, trucks, trailers and iceboats off the ice after a morning of racing was becoming emminent…a large separation of 8-12″ appeared parallel to the shore. 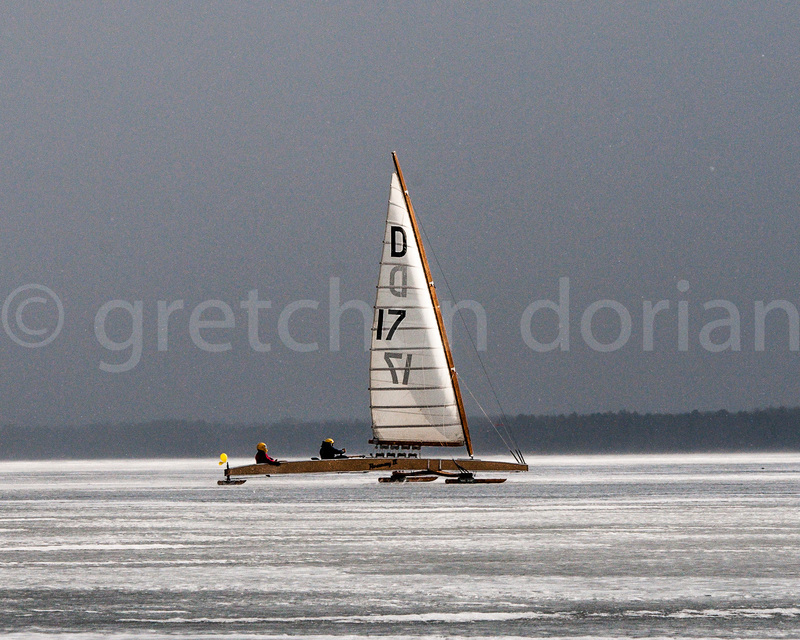 Postponement…also waiting for wind, found most everyone, moving boats onto the shoreside pieces of ice…pulling/pushing boats over crack to safety. That said, others said….I’m tearing down and packing up…as everyone had to drive home sometime late on Sunday afternoon. Me? I took a few pictures of breaking down, said my goodbyes and headed for the Mackinac Bridge and home…that’s another story. NOTE: It was called a “regatta” as enough races were sailed on Friday & Saturday. The trophy ceremony was held on shore, just after I left.